The sheriff in charge of the investigation into a shooting that killed one police officer and wounded six others in South Carolina says his deputies haven’t finished processing the massive crime scene in an upscale neighborhood. Richland County Sheriff Leon Lott said Thursday that until the work is finished, he can’t know how many weapons were used or shots were fired. Lott says a suspect is in custody but investigators aren’t to the point where they are ready to file charges. Florence County deputies have identified the suspect as 74-year-old Frederick Hopkins. Lott says the sheriff in Florence County asked him to investigate instead of the State Law Enforcement Division because his department based in the capital city of Columbia has plenty of experience in complex homicides. A South Carolina police chief estimates about 30 minutes elapsed before seven law enforcement officers who had been shot could be rescued. Florence Police Chief Allen Heidler (HEED-lur) said Thursday at a news conference that about a half-hour passed between when the officers were shot and when they were recovered with an armored vehicle. Four of Heidler’s officers were shot, one fatally. Three Florence County deputies also were shot while trying to serve a warrant Wednesday. A South Carolina police chief says two of his officers have been released from the hospital and another remains in serious condition one day after a man opened fire on officers trying to serve a search warrant. Florence Police Chief Allen Heidler (HEED-lur) addressed a news conference Thursday. One of Heidler’s officers died in the shooting. In all, four police officers and three deputies were shot. Heidler didn’t know the condition of the wounded deputies. He remembered slain Sgt. Terrence Carraway as “my brother.” They had served together three decades. Heidler said the sheriff’s office was the lead agency on the call outside the city limits and his officers arrived as backup. The deputies were serving a search warrant on a home Wednesday when a man inside opened fire. A man accused of shooting seven South Carolina law enforcement officers outside his home lost his law license decades ago over $18,000 in wrongfully collected attorney fees. The court wrote that Hopkins was ordered to jail after failing to return the money as part of a previous order. The order notes Hopkins was jailed for more than two weeks before the court allowed his wife, fellow attorney Cheryl Turner Hopkins, to be held jointly liable for paying back the money. Authorities have identified 74-year-old Frederick Hopkins as the suspect in the shootings of seven law enforcement officers in Florence Wednesday night. Florence Police Officer Terrence Carraway died from his injuries. The South Carolina sheriff leading the investigation of the shooting of seven law officers says it’s too early to go into details about the case. Richland County Sheriff Leon Lott said Thursday that the focus is on taking care of those who have been shot and their families. One officer died and six others were injured in Wednesday’s shooting near Florence. Florence County Sheriff Kenney Boone asked the Columbia-area sheriff to lead the investigation. Boone has not explained why he did not request that state police handle the case, as most South Carolina law enforcement agencies do in an officer-involved shooting. Lott’s department also does not usually request the State Law Enforcement Division to investigate such shootings. South Carolina’s governor has ordered flags lowered to half-staff after the shooting of seven law-enforcement officers, including one who died. Gov. Henry McMaster announced on Twitter Thursday that the lowering shows “respect for the law enforcement officers who were senselessly shot” the previous day in Florence. He asked South Carolinians to reflect on the officers’ sacrifice. Authorities say people are planning to gather by candlelight Thursday to honor the victims. A longtime officer killed in a shootout in South Carolina is being remembered as a caring man who loved giving back. WPDE-TV reporter Tonya Brown says she first met 52-year-old Florence Police Officer Terrence Carraway when she began reporting in Florence 22 years ago. Brown gave an emotional live report late Wednesday night outside the neighborhood where authorities say 74-year-old Frederick Hopkins opened fire, killing Carraway and wounding six other officers. Brown says Carraway “had a heart of gold.” She says the 30-year police department veteran had told her he was ready for retirement but wasn’t done giving back to his community. A man accused of shooting seven South Carolina police officers outside his home posted on social media about being a competitive marksman and taking his children shooting with him. Authorities have identified Hopkins as the suspect in the shootings of seven law enforcement officers in Florence Wednesday. Florence Police Officer Terrence Carraway was killed. The man accused of killing a police officer and wounding six other law enforcement officers in a South Carolina standoff is a military veteran who received disability payments after being wounded in the Vietnam War. That’s according to a South Carolina Supreme Court ruling in a divorce case involving 74-year-old Frederick Hopkins and his ex-wife Carol Hopkins. The court noted in the year 2000 that Frederick Hopkins was injured in the Vietnam War and he was receiving a disability payment of $1,127 a month. Hopkins also was a lawyer, admitted to the South Carolina bar in 1980, but was later disbarred. Authorities said Frederick Hopkins is under arrest in a hospital after falling on his head at some point during the standoff, which began when deputies tried to serve a search warrant at the home. The suspect in the shooting of seven law-enforcement officers in South Carolina is a disbarred lawyer who has been charged several times in recent years, starting with a 2014 count of disorderly conduct. Authorities identified the shooter in the Wednesday night incident as 74-year-old Frederick Hopkins. According to public court records, Hopkins’ charges include two in 2015 and 2017 for “running at large,” an offense related to not restraining one’s animals. Public records show he’s the husband of Florence divorce attorney Cheryl Turner-Hopkins. South Carolina Bar records show Frederick Hopkins used to be a lawyer but has been disbarred. Officials say one of the officers Hopkins shot was killed. 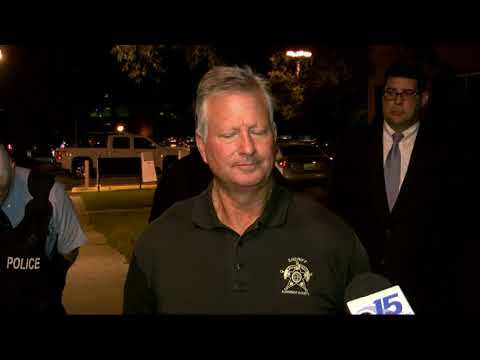 WIS-TV reports that Florence County Chief Deputy Glenn Kirby says Hopkins is hospitalized with a head injury and unable to speak with officers. Authorities have named the suspect they believe shot seven police officers in South Carolina as they tried to serve a search warrant. WIS-TV reports that Florence County Chief Deputy Glenn Kirby identified the suspect Thursday as 74-year-old Fred Hopkins. Kirby says Hopkins is hospitalized with a head injury and unable to speak with officers. WPDE-TV reports Hopkins fell at the scene. Kirby says officers were trying to serve a warrant involving an accusation that a 27-year-old person at the home sexually assaulted a foster child in the home. One officer was killed and six others injured Wednesday in an upscale Florence neighborhood. Authorities had to use a bullet-proof vehicle to rescue seven police officers in South Carolina who were shot by a man as they tried to serve a warrant. Florence County Sheriff’s Maj. Mike Nunn said three deputies were shot around 4 p.m. Wednesday from a man inside a home in an upscale Florence neighborhood. Florence Police Chief Allen Heidler says four of his officers were then shot, one fatally, as they rushed to the scene to assist the deputies. Nunn says the man held children hostage during a two-hour standoff, but they weren’t harmed. Authorities didn’t name the suspect or say why they were serving the warrant.